This is a section of my latest eBook, but I figured that it could be more useful as a blog-section which people could reference if needed and also makes it easier for me to update when new stuff appers to give a simple resolution for known errors. This is often the case if Storefront cannot talk back with the callback URL which is listed under Manage NetScaler Gateways à Edit NetScaler Gateway à Authentication Settings à Callback URL. Make sure that this URL is accessible from the Storefront server. If this is not possible because of network segmentation. You can deploy a dummy NetScaler Gateway VIP in the internal network. If you notice that you have an error in Event viewer stating that “Citrix AGBasic Login request has failed”. That might be that there are different domains specified on the NetScaler session policy and under Storefront. If you have specified a domain name in Storefront under Manage Authentication à Pass-through from NetScaler Gateway à Configure trusted domains, this needs to be the same domain name in the session policy as well. If you note that you have an error in Event viewer stating that Failed to run discovery this is most likely the case if you have not configured the use of a proper SSL certificate under the IIS administration console of the Storefront server. If you are prompted for another authentication after logging into the NetScaler Gateway portal, when redirected to the Storefront portal, and then this error message appears. 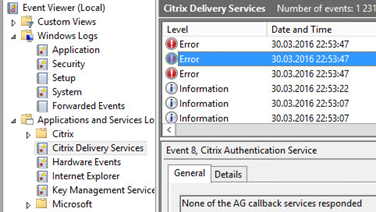 You can also notice an error in event viewer of the storefront server under Application and Services Logs -> Citrix Delivery Services. That states, “A request was sent to service that was detected as passing through a gateway, but none of these matched the request. This is typically the case if the NetScaler Gateway URL is configured wrongly. Since this URL needs to be the same as what the end-users are using, in case Storefront will not trust the incoming request and therefore ignore authentication attempts. This is a generic error which might occur in many different scenarios, but some key things to check to find the root cause of the issue. · STA available on the NetScaler and marked as up? (This can be checked under NetScaler Gateway à Virtual Server à Published Applications à STA Server. This might just be that the resource that we are trying to launch in currently unavailable or that something for instance is wrong with the VDA agents on that resource we are trying to launch. This might be that we have an STA server that is down, in which Storefront tries to communicate with or that we have configured the wrong STA server under NetScaler Gateway appliances in Storefront. This can be checked under à Manage NetScaler Gateways à Edit NetScaler Gateway à Secure Ticket Authority. When logging in you get an error message stating that login exceeds maximum allowed users. This is typically the case if we did not place the virtual server in ICA-only mode. By default, the global AAA settings of NetScaler Gateway is set to allow maximum 5 users logging in using VPN at the same time. If we go and change the settings of the Virtual server to ICA-only mode, this error will go away. After authenticating to the NetScaler Gateway portal you get a blank page with an error message stating Http/1.1 Internal Server Error 43531. This is typically the case if the Gateway cannot communicate with the Storefront web site. Which might just be a wrong URL in the session policy for instance. Or this can also be that a client is not being applied a session policy, if we for instance have session policies in place based upon different criteria’s. If someone outside those criteria would get those error messages. The easiest way to get them access is to bind a session policy with the highest priority number with an expression of ns_true. After authenticating to the NetScaler Gateway portal, you get a default IIS error message stating “Access is denied”. This is typically the case if the session policy does not point directly to the receiver for web site on Storefront. After changing, the session policy to point to the direct URL this error message will go away. There are many ways to troubleshoot authentication failures, the simplest one is using the authentication dashboard in the NetScaler UI. Which enabled under NetScaler Gateway à Global Settings à Change Authentication AAA settings. NOTE: This setting is disabled by default, because it might reveal to much information to malicious hackers which try to do a brute force attack, to get information on which users are enabled and not. It is also important that the aaad.debug command lists out different error codes when there is a failed authentication attempt. For instance, if a user with a disabled account tries to authenticate. Citrix has made a list which describes all these error codes and the meaning of them. 4001 Invalid credentials. Catch-all error from previous versions. 4002 Login not permitted. Catch-all error from previous versions. Now if a user tries to authenticate but is not bound to an authentication policy, for instance if we have multiple authentication policy for different groups, network segments and someone which fall outside of those policies try to authenticate they are presented with this error message. The simplest way to fix this is to either define ns_true authentication policy which handles all other authentication attempts. This is typically the case if there is a session policy bound to the user which has a default authorization policy of DENY, this might be intended but if not, we should change it to ALLOW. ← Next-generation Application Delivery Controllers?